Nothing will work. He will keep jumping and biting you until you’re inside, away from him. Max’s Mom, it sounds like you need to spend more time with Max. Is Max getting enough company? Dogs like to hang out in packs. In the house, they will usually follow you around in order to be close to you. If your dog is spending lots of time outside alone, not only is he lonely, but he’s not learning how to behave around people. 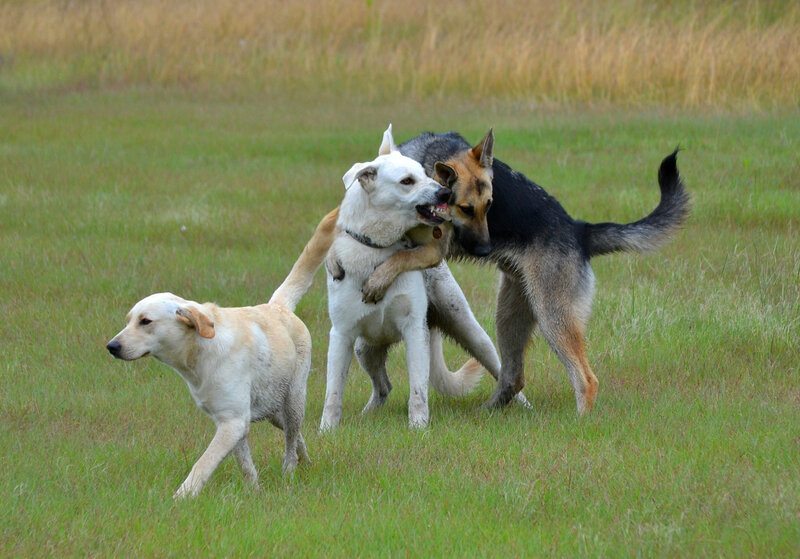 Dogs play by jumping on each other and mounting each other, especially when they are young. So, if he’s not drawing blood, he might just be trying to play. I would not hit him or deny him food. Neither one will keep him from jumping on you. To keep him from jumping up, you can keep a leash on him and stand on it when he’s about to jump. When he bites, try yelling loudly to let him know that’s too hard for human skin. If he continues to jump and bite, just cross your arms and turn your back. Ignore him until he calms down. Every time he gets over excited, stop playing and turn around. Next, I’d find some games to play with him. Try teaching him how to play fetch. Take two tennis balls, throw one. When he goes and gets it, if he won’t give it back to you, show him the second one and throw that one. Then pick up the first one. With patience and time, Max will learn how to play in a way that’s comfortable for you because he really wants to play with you. ← How do I discipline my dog? When I give my dog a special treat and I walk close to her, she growls thinking I am going to take it away from her. I have looked away when she barks and she stops but only that time. Your dog is being a normal dog and defending her treat from others. Unfortunately, you wouldn’t want her to get aggressive with strangers or small kids. I’d start slowly. Make her sit and stay. Put a treat down, pick it up. Put it near to her, pick it up. Every time she’s good, I’d say good girl and give her a different treat. I’d also make her wait until an “ok” command to eat her food. And occasionally say stop and take it away.I would do all this over many days. So just add a bit every day and reward all small steps! Eventually, you’ll work up to where you can give her something and then take it away. Always reward her with food when you do take it away! Or let her eat again soon.